Athletes from around the world will soon compete for a spot on the winners’ podium. While winning is quite the accomplishment in itself, we all know the true goal each athlete strives for is bringing home a gold medal. Similarly, as a job seeker or even as a new employee, you should be striving for more in your professional life. As you work to achieve a gold medal in job performance, we’ve compiled these five tips to help. No athlete makes it to the top without setting clear goals. While the long-term objective of any athlete is to finish first, most set milestones along the way to help them reach that success. The same goes for your professional life. As you strive for gold medal performance, set clear goals to guide you along your path to your best job performance. The world’s finest athletes are arguably the most dedicated athletes on the planet. They spend years training for the chance to be the best. But, the training is done on a day by day basis. It’s something these athletes wake up thinking about and fall asleep dreaming of. They are dedicated to their sport, adhering to the strictest of diets, training regimes, and rituals. For you, dedication to your profession is just as important to be at the top of your game. Use every day as an opportunity to be a better professional than you were the day before by finding new development opportunities. As training intensifies, athletes have to be aware of their body’s limitations. When they push themselves too hard, they can end up injured or exhausted. When it comes to job performance, you also need to know your limits. If you take on more than you can handle, you’re less likely to provide stellar results. Instead, focus on pushing yourself to do things to the best of your ability without overdoing it. Teamwork is just as important in the office as it is on the court. Fostering healthy relationships with your peers can help you grow as a professional, learn things you may not have known before, and get efficient, positive results. In competition, only one person or team gets to take home the gold. For those who go home with silver, bronze, or nothing at all, they have a choice. They can either give up and be done competing, or they can learn from their experience and continue training to compete again. In your career, failure is a possibility. Instead of fearing it, accept it when it happens and make a mental choice to continue striving for the gold. 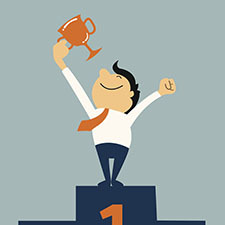 How do you work toward gold medal performance in the office? Let us know in the comments section below! I strive everyday to be my best. I try very hard to go over and above my job duties. I keep both of my offices clean for a professional atmosphere and treat everyone who walks through our doors with respect. At the end of my day, I make sure I have made things easier for the next person. I truly believe that if you do right by other’s they will do right by you! Say, Do, and Follow through with every task to stay focused! Some say ‘you can’t teach an old dog new tricks’, thats not true. You can and through teamwork he/she may be able to teach you what he/she has learned through their own experinces. I will succeed no matter, what the world throws at me. Each experience is a stepping stone to the next.